Tarazod Films & Media LLC: Mad City Chickens screens in Toronto Tonight! Mad City Chickens makes it’s Ontario, Canada premiere today at a screening in Toronto. 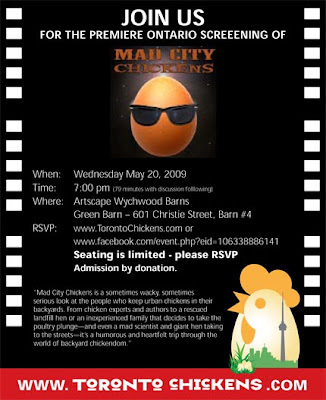 The showing is sponsored by the Toronto Chickens, an urban poultry group who’s goal is to get the laws changed in Toronto to allow backyard chickens within the city.